The 2013 Nobel Prize in physics was announced this morning; the awards went to François Englert and Peter Higgs for the theoretical prediction of what eventually was dubbed the Higgs boson. After last year’s exciting experimental results, this award was more or less expected by many of us, and certainly deserved. The prediction of the existence of the Higgs boson (albeit in a slightly different form than the one we know today) helped solve some major problems in particle physics. Those ranged from why the weak force carrier particles (the W and Z gauge bosons) are so massive when every other force carrier is massless, to certain mathematical sticky points in quantum field theory. All in all, it was an impressive prediction. As Matt Strassler points out, it’s all the more exciting because Higgs, Englert, and their colleagues weren’t among the big names in particle physics at the time. They were young and unknown, and for the most part didn’t play a huge role in the particle physics revolution that followed. Peter Higgs is a retiring sort, mostly reluctant to accept media attention, unlike many other Nobel laureates (before or after they received their prize). So What’s the Big Deal About the Higgs Boson, Anyway? (Double X Science): A basic explanation of what the Higgs boson is and why its discovery was important, written in question-and-answer format. The Higgs Boson, in Theory and in Experiment: Some physics background on the Higgs boson, written slightly before the data demonstrated its existence. I wrote this in the midst of a big particle physics conference, in between presentations by and conversations with researchers. Our Higgs: We found the Higgs boson! But which one? The big question is whether the experiments turned up the same Higgs particle predicted by Englert, Higgs, and colleagues, or one of the variants in extensions to their original theory. Grumpy Cat shares my sentiments. I don’t think any reasonable person would claim that Englert and Higgs are undeserving of an award. However, there’s still some problems looming over this award, and they’re almost entirely because of the arbitrary rules and traditions of the Nobel Prizes. The year 1964 marked the publication of several papers, written by Higgs, Englert and his colleague Robert Brout (now deceased), and the trio of Gerald Guralnik, Carl Hagen, and Tom Kibble. Additional important contributions came from Phillip Anderson (himself a laureate for unrelated work), meaning that at least seven people share credit for the Higgs boson in some respect. Yet, no more than three people are ever awarded the Nobel Prize in physics, so Higgs and Englert got it, and the others were left out. Sean Carroll has a lot more to say on that subject. Similarly, there has been some justified grumbling that there’s no equitable way to reward the experimental collaborations that, you know…actually discovered the particle. The list of contributors to the CMS and ATLAS detectors at CERN is huge, and while not everyone who worked on them can claim equal credit, there’s no fair way to pick three people to give the lion’s share. The real solution is to grant the prize to the collaboration as a whole (and I’ve heard rumors that CERN may be awarded the Nobel Peace Prize, though I have no idea how realistic that idea is), but there’s no precedent for that. 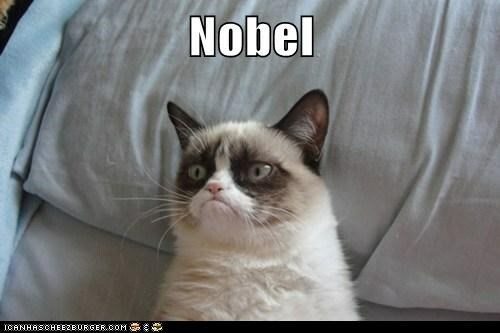 The Nobel Prize is also a major award. And of course, in the end we have to remember that the Nobel Prize is not the end goal of science. It’s a major award, arguably the most prestigious in many fields, but it’s largely that way because we let it be. If we stop thinking about the Nobel Prize as being The Biggest Deal Ever, if we stop idolizing and idealizing a small handful of Important Men (only two women have received physics prizes), maybe we’ll come to a better public understanding of science. Again, this isn’t to denigrate Englert and Higgs, only to say as I’ve said before: science is collaborative and cumulative. To set certain people up on pedestals as being greater than all the rest of us put together is to present a misleading view of science, one which harms both us and those we honor. Anderson, by the way, is the only one of this list that I’ve met. He also snored in my ear when he fell asleep at a seminar we both attended at Princeton.